Free Wi-Fi in public areas and in rooms and ADSL Internet point. Motorcycle parking in a covered garage, free of charge. Bike and Mtb rental also with pedal assistance. Multifunctional tavern for meetings, parties, dance. 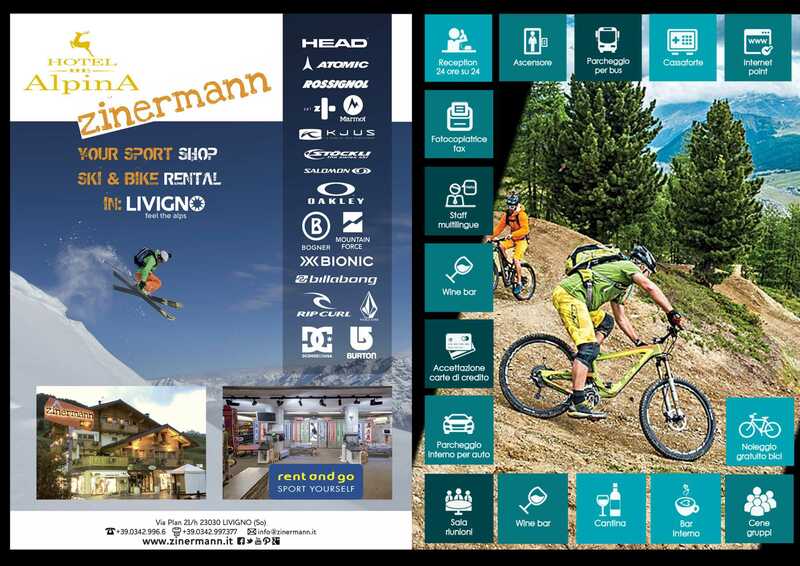 Free Livigno Card for all guests of the Hotel Alpina, which allows free entry (or at a reduced price) to all cultural / sporting activities proposed by the Tourist Company and allows easy access to all the lifts in the Valley. Home of health and doctor of guard at 1500 mt. Ski-pass and ski school at 100 mt. Free bus stop for the whole country at 30 meters. Shops, boutiques, perfumeries, food, sporting goods directly in the Hotel Street. Taxi and connections to/from the airport or railway can be booked from the hotel, also with buses up to 9 seats.